Menopause is a normal part of every woman’s life. It is a transition that ends the reproductive years of a woman. After menopause, the woman is no longer fertile or will not be able to get pregnant anymore. The reason most women dread menopause is that of the menopausal symptoms that can be experienced up to several years. The symptoms begin once the woman approaches her menopausal years, and some symptoms can even be experienced during the post-menopausal stage. 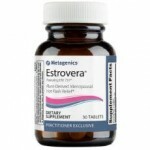 Estrovera is a natural menopause relief supplement. It claims to have clinically demonstrated to relieve menopausal symptoms like hot flashes, sleep disturbances, irritability, anxiety, mood problems, exhaustion and vaginal dryness. There are many management options for menopause symptoms like lifestyle changes, hormone replacement therapy (HRT) and the use of menopause supplements. The use of natural menopause supplements is currently the most popular because of their safety and effectiveness. Let’s take a look at one such menopause product that is currently very popular and determine if it is worth purchasing. The product’s website claims that Estrovera is the new gold standard for menopause relief. Who is the Manufacturer of Estrovera? Estrovera is from a reputable manufacturer Metagenics, which offers a wide range of products. It has been around for a long time, so there is a high probability that they offer high-quality products. This menopause relief supplement is recommendable since scientific data back it. Also, the product comes with a money-back guarantee which allows anyone to test if the product is effective for them or not. Estrovera reduces the severity of menopausal symptoms. The actual details of how it does so are not found on the products. However, there are many clinical studies with details available on the menopause supplements website proving the effectiveness and safety of the only active ingredient in providing relief to symptoms of menopause. Other websites claim that the key ingredient helps fill in the estrogen deficit during menopause that is the primary cause of menopausal symptoms. Estrovera Ingredients – Are they Safe & Effective? Other ingredients: enteric coating, ammonium hydroxide, oleic acid, croscarmellose sodium, and others of the kind. What are the Advantages of Estrovera? What are the Disadvantages of Estrovera? What are the Precautions When Using Estrovera? The product is not to be used by women who are currently pregnant or nursing. It is also contra-indicative for women who have or are suspected to have estrogen-dependent cancer. How Should You Take Estrovera? Estrovera cost $55 for 30 tablets. Estrovera does seem like a reliable menopause relief product that women could take advantage of to handle their symptoms of menopause. This is quite convenient when it comes to it. However, it’s also true that there are quite a few things that you’d have to account for. Right off the bat, the claims are rather challenging. They don’t seem to be thoroughly supported by the ingredients and the working process of the product. At the same time, the reviews are quite ambiguous – this is also something worth accounting for. The product doesn’t seem to be as reliable as it claims to be and there are better options that you might be able to take advantage of.